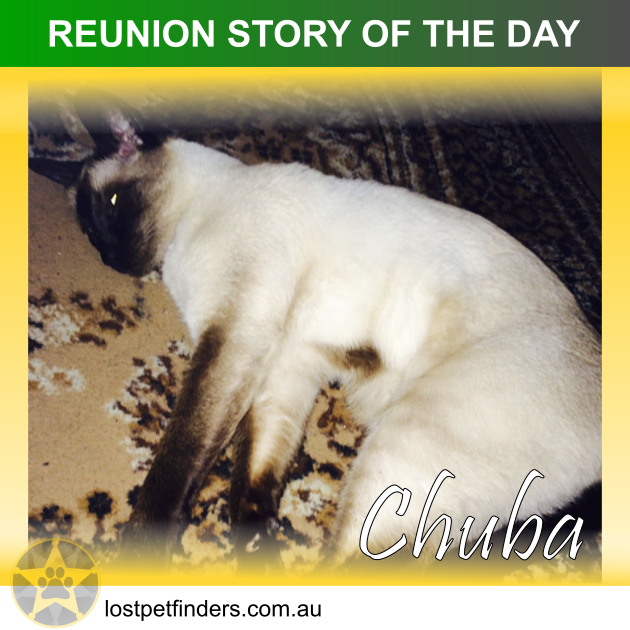 "After five weeks of frantic searching and leaving no stone unturned I have finally found my beloved Siamese “Chuba”!!! Chuba was found a few kilometres away from where we live by a kind and generous and loving couple who fed her and sheltered her and spend time with her and protected her until she and I could be reunited. They even organised people to come and watch out for her and feed her when they had to go away. Looking after Chuba must’ve been a thankless and heartbreaking task because Chuba tends to be very unfriendly and very unforgiving. I have known people for years that Chuba has still not accepted and yet for some reason she found her way to this particular address and to M, a very particular person, who for some unknown and frankly unfathomable reason Chuba knew she could trust and knew would help her. This couple went above and beyond in their dedication and commitment to safeguarding Chubas safety and our reunification and I will never be able to thank them enough for what they have done for me and my beloved Chuba... Thank you guys. And above all, thank you M. I can more than imagine how you are feeling right now. I am so sorry. Bless you. If there is hope for me, then there is hope for EVERYONE!!! And the secret is NEVER GIVE UP. I thought Chuba and I would never see each other again because she will not go to people and will never let anybody handle her. It is a miracle she trusted M. She is like a cat-whisperer. I’m still in shock. Anyway, through lostPetfinders I reached out to thousands and thousands of people. I issued lost pet alerts and Facebook boosts. I contacted eight different councils surrounding my local council. And golf courses and primary schools. I postered far and wide and I did letterbox drops in all the streets surrounding where we live. I contacted over 50 different veterinarians and emergency surgery clinics in my surrounding area. I Posted to Facebook. Rang all of the lost animal pounds and shelters. Used Gumtree and lostcritters and many other sites on the Internet where you can post profiles of lost pets. I spoke to the local postman, informed local police, wedged Chubas bedding under the roof racks on my car to disperse her scent, sprinkled her kitty litter all over the front nature strip, Contacted local newspapers, spent hours walking the area calling her name and swishing and flicking one of her favourite toys so the sound would attract her... And everything else I could think, including Contacting local dog walkers and postering places of high traffic such as bus stops and supermarkets and going on dusk and dawn walks and talking to anyone I came across and letting them know personally that I was missing my cat followed by a brief description.... every single day I try to spend two or three hours doing everything I could. Googling “ how to find a lost cat” and “ catch types and whether they go and they are lost” and so on and so forth was also enormously helpful. d that she depends on me. And that it is not the time to feel sorry for myself when she is so totally dependent upon me to find her. So I never gave up and I never stopped and I kept the wheels turning and turning...and To my shock and against all the odds with a truly difficult and skittish and frighten cat we beat the odds. M, my and Chubas guardian angel, just so happened to alter her routine one day and to come across one of the posters I had placed increasingly further distances from my home and called me and reunited us. Secondly, that the world is full of good and decent and loving, generous souls like M, my guardian angel, and that somewhere closer than you might think, your precious is being cared for and is hoping and waiting and praying you never give up looking for them and that you will be there soon. -Microchip your pets! And update your details if they change! -Register your pet with your local council! -Ask your vet EVERY VISIT to check the microchip is still working and is still detectable and hasn’t moved position! Consider a GPS collar or a GPS implanted chip... Microchips and GPS chips are different! Microchips don’t emit signals and can’t be “located”! -and never take anyone’s word for something and make sure you check the pounds and lost animals shelters personally and regularly! Never allow yourself to give up. Remember that they are waiting. And that they miss you! Now it’s off to the vet to enquire regarding GPS chips! !